I have eight weeks before my target 5k race and I am within 3 pounds of racing weight. I say that tongue-in-cheek, because while I am at a nice 114, I lost three pounds over the weekend with the flu. It was a total melt down, and most likely it was not the flu but food poisoning that I did to myself. That is one way to slim down fast, NOT recommended. Today is the first day I ran in 5 days, I did a 3.5 mile jog around the trails, my stomach not feeling great but okay. I feel about 70%. What is letting me know I am not too well is my lack of desire to eat yet and rather just drink Emergen-C and Alka-Seltzer. That stuff is pretty great. (and my extreme crankiness) I never take anything, no aspirin, nothing, but when I gave in to Alka-Seltzer it was awesome. I was staying at my friend’s, Laura and Hondo’s home in Albuquerque (and I cannot imagine a better place to be while sick, plus I really dig ABQ) and after trying their Alka-Seltzer I had to buy some. I know it sounds simple, but I never buy pain relievers. I prefer to feel the pain from training errors, rather than mask it and damage myself more. Training was going great before I got sick. I saw Dr. Damien Passalacqua, chiropractor because all the PT was not helping my weird right leg and oh boy, did I feel good. I did a track workout on Tuesday, 6 total miles with warm-up and cool-down, of 400’s in 1:40 or 6:42 pace. I have not been able to do anything under 7:10 pace without my leg flaring up. But this was a piece of cake, it was as if I was running a 9:00 pace. It felt so good, finally. But then I got sick and I am a little set back, but nothing to worry about for the race. Finally it is Boston Marathon Day, my favorite day of the year. While I did not run this year, I cancelled entry, I was thrilled to see Kenyan born, Santa Fe, New Mexico based Carolina Rotich win today. That is the NM pride in me. I would have also really loved to see Desiree Linden win, Desi is always my number one pick! But that smile on Carolina’s face could not be beat. Right now I am having the most fun running I have had in a long time. Despite my continued right leg burning muscle shut down on uphills that I have been dealing with for three years, training has been great! I think this is the first time that I have had a training partner my own age, my own ability, training for similar races and able to run 3+ times a week together on road, trail and track. One thing I always wanted to see, or do, in New Mexico is the pilgrimage to Chimayo. Considered one of the top 10 Catholic (of which I am not) holiest places in the word, over 12,000 people walk to the church, the Sanctario, on Good Friday. 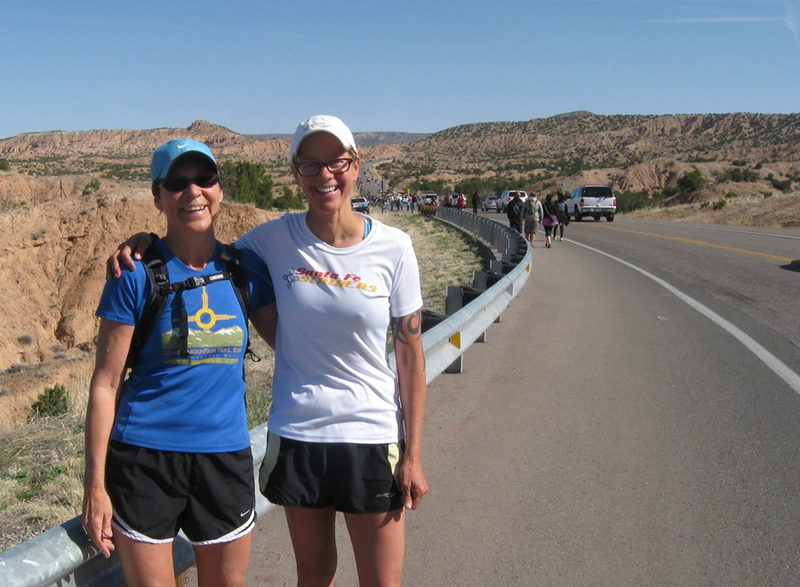 It turned out Michelle, who has lived in Chimayo for about 15 years always wanted to run it, but never had anyone to do it with. So this year, my first full year in NM, she and I ran. People walk from over 100 miles away, some dragging enormous crosses, many with commemorative t-shirts. And while it seems that it would be a somber event, come on, Jesus was crucified, people were really friendly, joked, and then ate Fritto pie and roasted corn at the church. We ran 13 miles, went home and ate almond butter and banana on gluten free toast. It was delicious. We continue to go to the Pojoaque track to do workouts. Yesterday was 6 x 3:00 at 7:00 pace with 2:00 recovery. I still find it hard. My HR, that was at the lower end of tempo, I was 20 beats below my max, but every time I get to 7:00 pace, around 165HR, my leg goes wild and shuts down about 2:00 into it. We cut back a bit, but it did not help starting at a 6:30 pace. It can be hard dialing that pace in on the track. We ended with 7:15 average and at 6,600 ft, I will take that in a heartbeat! Nine more weeks to the Roswell Senior Olympics!